Passers-by stop to watch as flames envelope a young Buddhist monk, Saigon, October 5th, 1963. 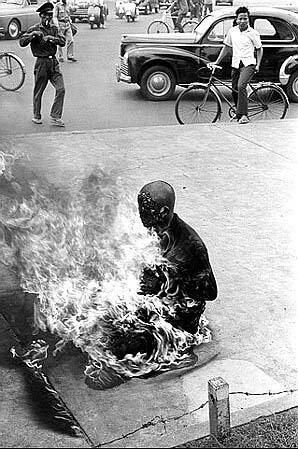 The man sits impassively in the central market square, he has set himself on fire performing a ritual suicide in protest against governmental anti-Buddhist policies. Crowds gathered to protest in Hue after the South Vietnamese government prohibited Buddhists from carrying flags on Buddha's birthday. Government troops opened fire to disperse the dissidents, killing nine people, Diems government blamed the incident on the Vietcong and never admitted responsibility. The Buddhist leadership quickly organized demonstrations that eventually led to seven monks burning themselves to death. I guess you must eventually become immune - the man behind the monk is still trying to find a light for his cigarette.